You are here: Home / Makeup / Make Up Beginner: Where Do I Start? The Questions Before You Buy! Make Up Beginner: Where Do I Start? The Questions Before You Buy! The Basic Questions Before You Buy! Normal, Oily, Dry, Combination, or Sensitive? Experiment!!! You can get away with any type of foundation! Lucky you! No dewy finishes!!! If you skin is already shiny then you don’t want to add more shine to your face. Stay with a matte or satin finish in a liquid or powder and set it with a powder if it is a liquid. Liquid, cream, or mousse foundations moisture is key so powder foundations aren’t the best for this skin type. Satin and dewy foundations help give dry skin a plumper look. If you’re on the oilier side of combination skin look for formulas that state they’re long lasting or oil free. Stay away from dewy finishes. If you’re on the drier side, then look for a mousse not creamy the texture maybe too heavy. If you are sensitive you are also either…..oily, dry, or combination. Choose a foundation from the recommendations above that are also formulated for sensitive skin. Acne, Aging, and Mature Skin are not Skin Types!!!!! When you’re testing foundation shades, it is critical to identify your underlying skin tone and find a foundation that matches it. 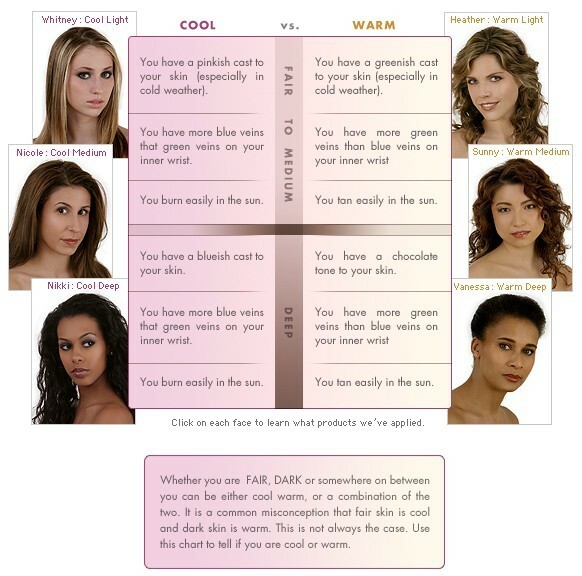 You may have a red or ashen skin tone on the surface but your underlying skin tone is different. You want to neutralize whatever overtones are present thus matching the skin’s natural undertone. Try on foundation before you buy! Making it sure it matches your skin exactly (especially in daylight, when it is the most noticeable) the more natural looking the better. Dab a little foundation on your jaw line and blend it. Go outside and see if you look like you’re wearing foundation or a mask! Eyes & hair: blue, gray, or green and have blond, brown, or black hair with blue, silver, violet and ash undertones. Eyes & hair: brown, amber, or hazel eyes with strawberry blond, red, brown, or black hair. Their hair tends to have gold, red, orange, or yellow undertones. 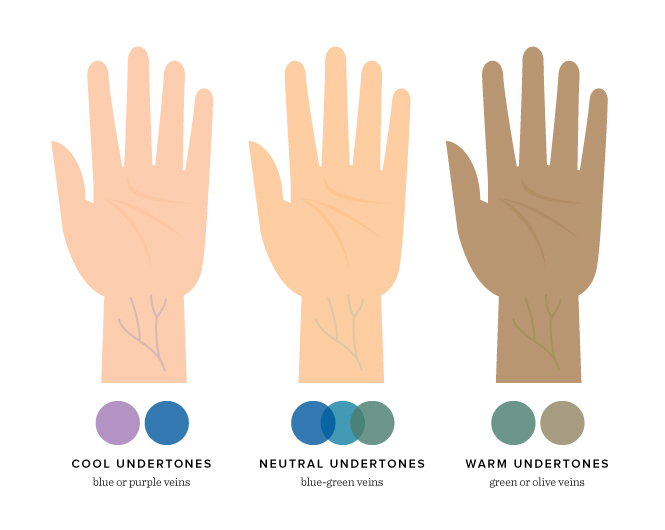 Understanding that our skin’s surface tone is the color you’d describe yourself as having (ivory, light, medium, tan, dark, etc.) Your skin’s undertone is the color underneath the surface. Check Your Veins: look at the veins on the inside of your wrist. Are they blue or green? If they look more blue, you likely have cool undertones. If the veins look greenish, you’re warm. Still not sure hold a piece of white paper next to your veins. 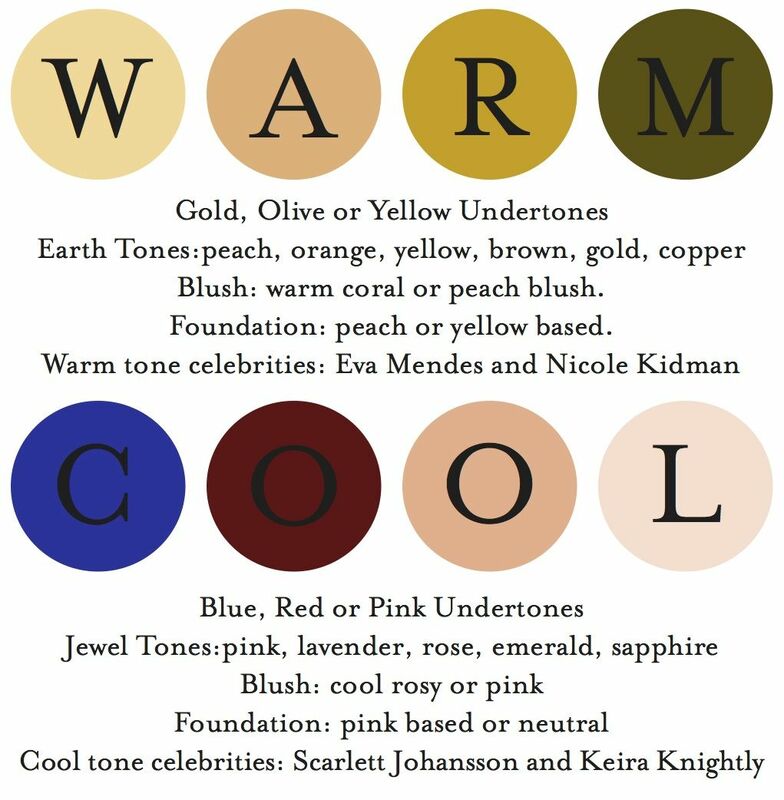 Many make up lines are marked as warm, neutral, or cool compare the colors to your skin. If you go to a make up counter don’t let them push you into buying! Instead of the doing one make up look on your entire face have them do one on one side and one on the other. Be fair to the counter person don’t spend an hour of their time on you if you are not going to buy anything or just one lipstick. They usually get commission and if they could’ve been helping some one else or multiple people in that hour earning money. Work with them! Tell them how much you want to spend, where you will be wearing the make up (work, dates, et cetera), and how much time you want to spend putting on your make up. Tell them you would like to step outside with a mirror to see how the make up looks in natural light. Be upfront, but nice if you don’t like something about the make up look tell them so they can adjust the look to your preference. Don’t be vague; be specific communicate you wishes. Start simple!!! Lipstick, blush, foundation, concealer, mascara, and a few eye shadows that you can wear together or separately to get more looks! Foundation tends to be the most expensive item, remember a little foundation goes a long way so you will get your moneys worth. You can always buy more later! Save lip liner, eye liner, primers, bronzers, and highlighters for another time, no need in overwhelming yourself! Your make up should be an extension of you not a remodel! « Website Review: Charlotte’s Book! The Angie’s List of Health & Beauty!